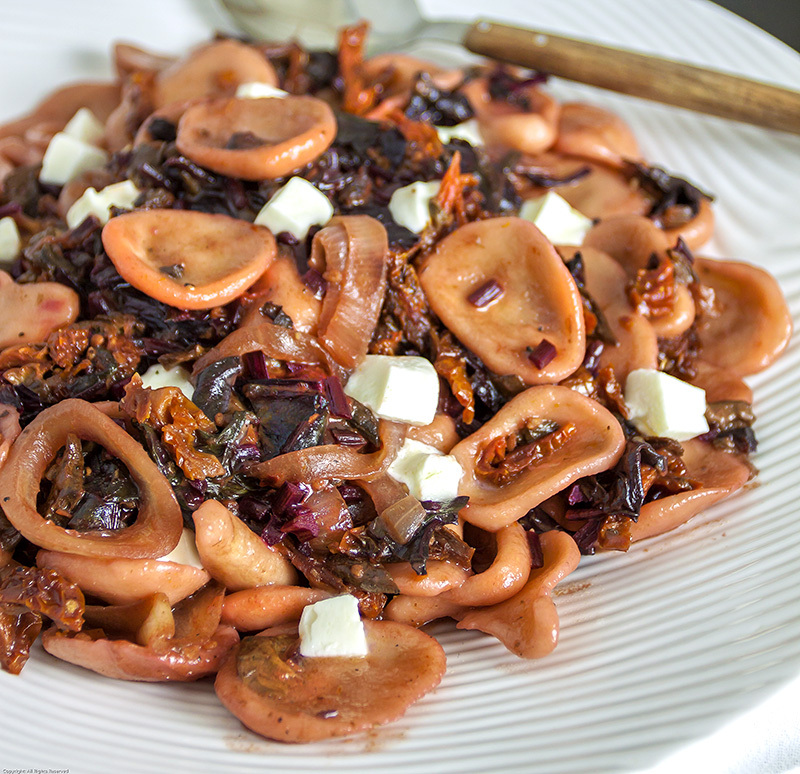 Orecchiette is a different sort of pasta. First of all, there’s the name. It sounds like some sort of musical instrument and it is, in fact, named after an organ. But not that kind of organ, but rather, the organ of hearing – the ear. Orecchiette is Italian for “little ears” and it’s easy to see where this sturdy pasta got it’s whimsical name. Each little circular pasta disc resembles a small, rounded ear and no two are alike. Orecchiette also differ from other pastas in that the dough contains no eggs; they’re made of nothing more than flour and water. Most recipes for orecchiette dough call for a blend of flours, semolina flour and regular wheat flour (hard durum, if you can get it, but soft all-purpose flour works fine). Handmade orecchiette are thicker than other pastas, giving them a satisfyingly chewy texture which is well-suited to hearty preparations such as this one. Orecchiette do require a certain amount of kneading, but once that’s done, the real fun begins. Get the kids (young and old) involved. Everyone will enjoy squishing the bits of dough into ear shapes and there’s really no wrong way to do it. It’s never to soon to introduce budding cooks to the joys of eating something that you made yourself from scratch. Put both flours into a large bowl and mix well to blend. Create a hollow in the middle of the flour and slowly begin adding water, mixing with your hands until a pliable dough forms. Start with about 1/2 cup of water, adding a little more as you go, if necessary. Flour a work surface. Here’s where the real work begins. Knead the pasta dough for AT LEAST 7 minutes, which seems like a lot longer than it actually is when you’re kneading a stiff dough. Set a timer if you need to, because you don’t want to skimp on the kneading time. At first, the dough will feel dry and stiff, but keep at it. After a few minutes, the dough will lighten in color and texture and become smooth and springy. Cover the dough and you both can rest at room temperature for a few minutes. 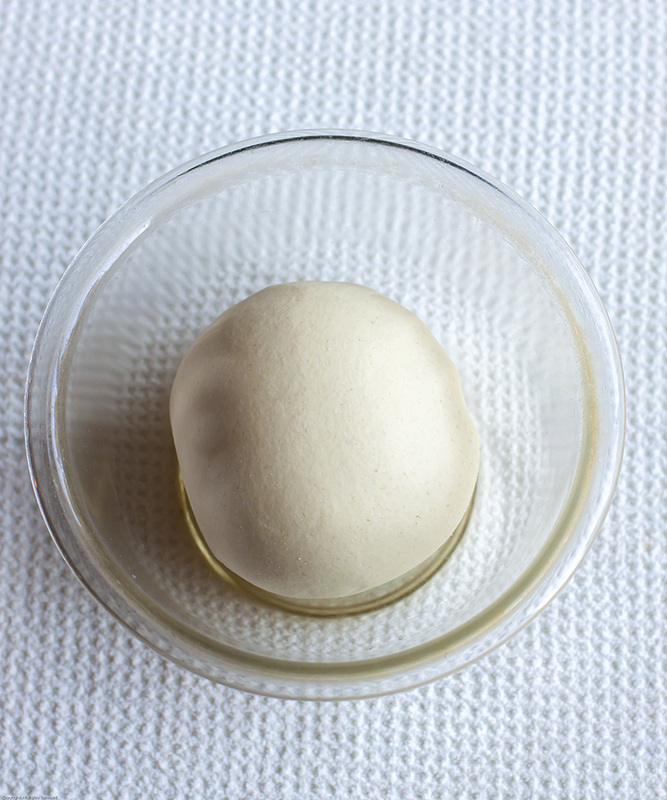 First, cut off a piece of dough about the size of a golf ball and then roll it into a cylinder about 3/4 inch in diameter. Next, slice the rolled out dough into a series of flat discs, each about 1/4 inch thick. Here’s a neat trick for easily making the “ear” shape. Flour your hands and then press a disc between the ball of your thumb and the palm of your other hand. Rotate your palm (not your thumb) while gently pressing to form a saucer-shaped pasta with no tears. It doesn’t matter if it’s lopsided or irregular in shape – it will taste great and look like the rustic, handmade pasta that it is. Place the finished orecchiette on a floured baking sheet. Repeat until the dough is used up. It goes very quickly once you get the hang of it! Cover the finished orecchiette with a clean towel until ready to use. Any remaining orecchiette can be frozen while fresh or dried completely for storage of up to several months. 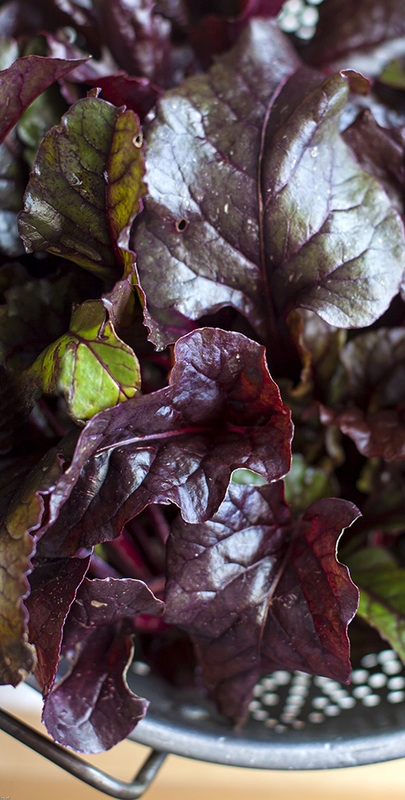 We used beet greens in our version of this easy pasta dish, which imparted a rosy pink-ish hue to the pasta, but you can use any hearty greens – kale, chard, arugula or mustard – with equally good results. Simply omit the butter and cheese for a completely vegetarian version. Reconstitute the dried mushrooms by pouring over enough hot water to cover. Allow to stand for 15 – 20 minutes or until soft and pliable. Drain, reserving the soaking liquid. Rinse the dried mushrooms under cool running water for a moment, then drain again and chop coarsely. Slice the onion into 1/4-inch thick rings. Heat 1 tablespoon of the olive oil in a large saute pan over medium heat. Add the onion and reconstituted dried mushrooms and cook until onion is softened, 6 to 8 minutes. Add the crushed chile peppers, sun-dried tomato strips, vinegar and a little of the reserved mushroom soaking liquid. Cook until most of the liquid has been reduced, about 2 – 3 minutes. Remove the mixture from the pan and set aside. Add 2 tablespoons of the olive oil to the saute pan. Turn up the heat to medium-high and add the chopped greens. Cook, stirring frequently, until the greens are tender, about 5 minutes. Stir in the reserved sun-dried tomato/onion mixture, season generously with salt and pepper, and turn off the heat. Bring a large pot of salted water to a boil. Add the orecchiette and cook until al dente, about 8 minutes if using fresh or up to 15 minutes if using dried. Drain the pasta, reserving about a cup of the cooking water. 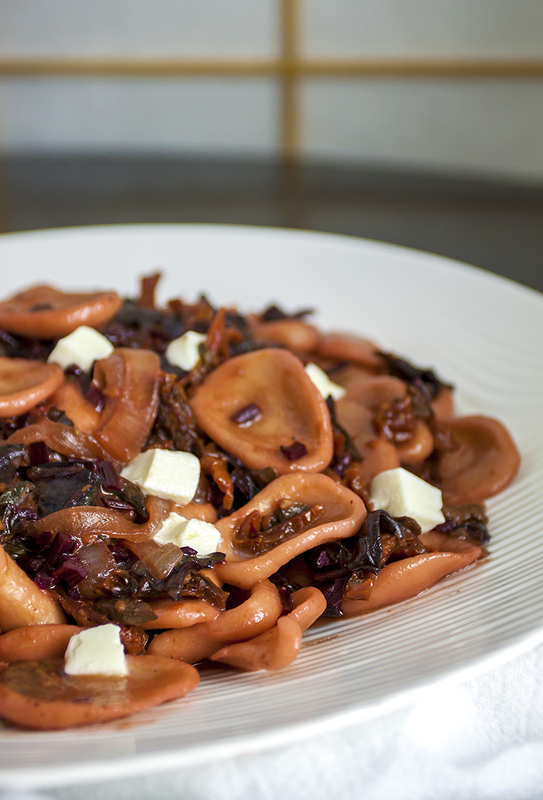 Return the cooked orecchiette to the pot, along with the greens, 2 tablespoons of butter and the grated parmesan cheese. Return to medium heat, stirring in just enough of the pasta cooking water to make a light sauce that clings to the pasta. Taste and add more salt & pepper as needed. Serve in pasta bowls, adding cubes or slices of fresh mozzarella at the table, stirring them in until they gently melt.